Google didn’t announce a new version of Android at I/O. In fact, all enhancements to Android are coming as app updates. Still, Google took the time to prepare a couple of videos to tease Android devs attending I/O with hints of Key Lime Pie, the expected codename of the next version of the mobile OS. The first one came up during a talk by Reto Meier, Android Development Relations Tech Lead. He was talking about how Google wants devs to use only as much of users' info as they need to create a magic experience. 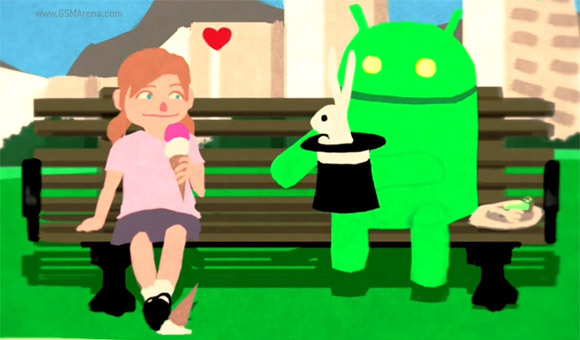 It featured a girl eating an ice cream (cone, not sandwich) and Bugdroid (Android's mascot) munching on a key lime pie (starts at around 24:30). 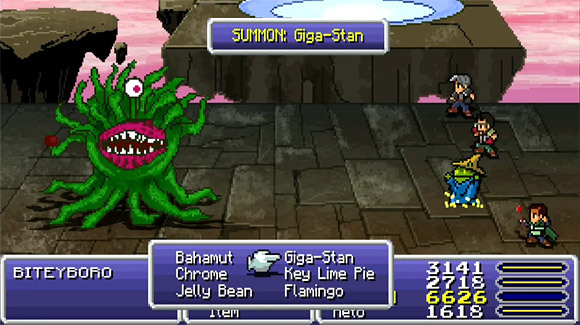 The next one is a Final Fantasy type of game screen that shows Bugdroid (along with his cohorts Larry, Serge and Reto) fighting a monster and summoning Giga-Stan, with two of the other spells reading "Jelly Bean" and "Key Lime Pie" (starts at 44:30). a final fantasy smartphone? exciting!